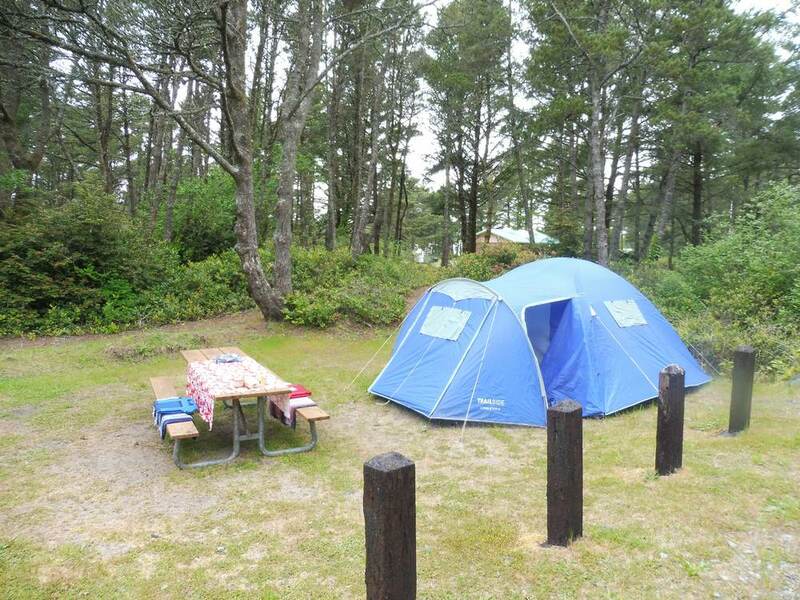 When we went to go put up the tent in Tillamook, we realized we had completely forgotten that the elastic tension cord inside one of the sets of tent poles had snapped when we last put the tent away. I didn't think this would be a big deal and figured the tent poles could be put together without the elastic. That theory proved to be incorrect. Chris and I spent about an hour weaving the broken elastic back through the poles and ... success! We were able to get the tent back up. We were also feeling pretty pleased with ourselves about our great team work and ingenuity in the field. Just like Tofino, the beach has tons of driftwood. 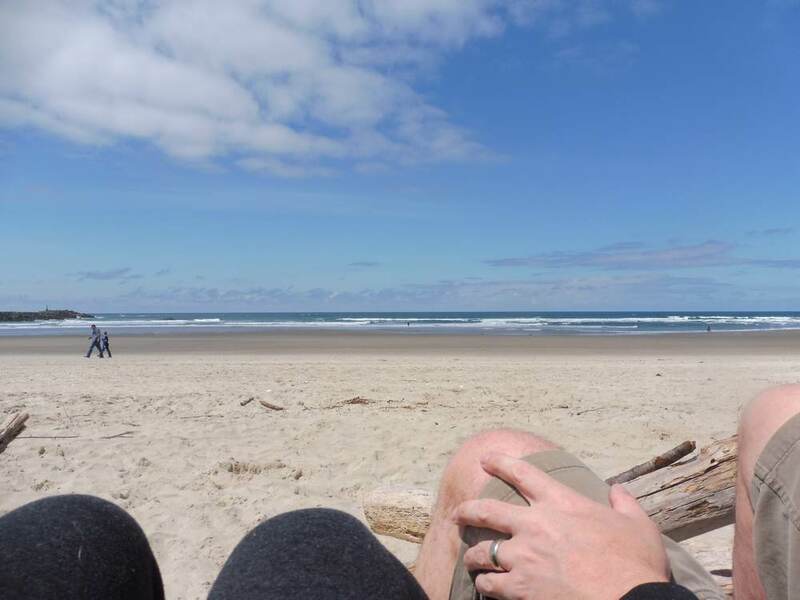 Chris and I found a groot someone had previously setup, made ourselves comfortable in it, and spent many hours watching the waves. Our final leg home took us through Cannon Beach for a late lunch on the waterfront, then over the two very long and narrow bridges of Astoria, through Seattle traffic, to the Canadian border (thank you Nexus for keeping us out of the 70 min border lineup and getting us through in under 5 min! ), and then eventually home late Sunday night. We spent Monday glued to the sofa as we recovered from the 17 day, 6000km trip. And if you're curious, here is our trip summary and the license plates we saw. Day 1, May 4 Vancouver -> Seattle. Stayed at the Motel 6 in Issaquah. Day 2, May 5 Seattle -> Boise. Stayed at the Airport Quality Inn in Boise. Day 3, May 6 Boise -> Price area (small town about 2 hours south of Salt Lake). Camped in a small rec area. 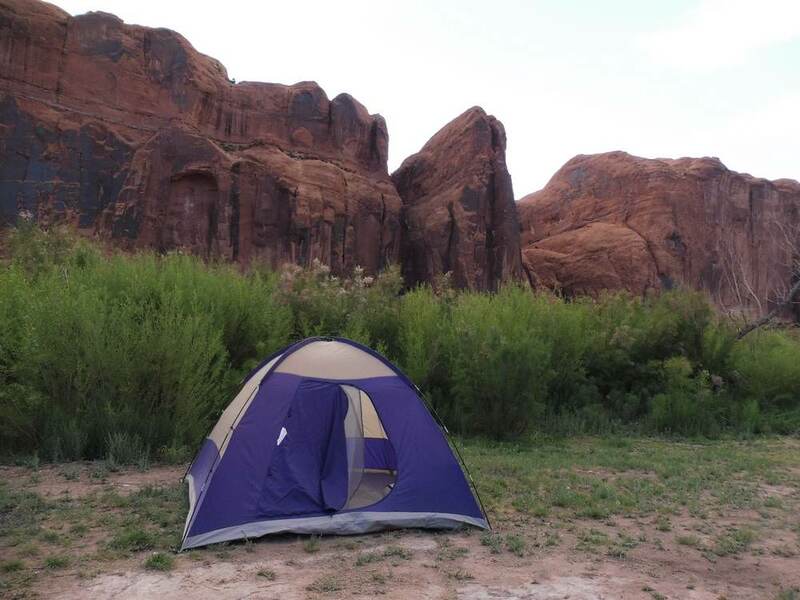 Day 4, May 7 Price -> Arches National Park. Stayed in Kane Creek campground. 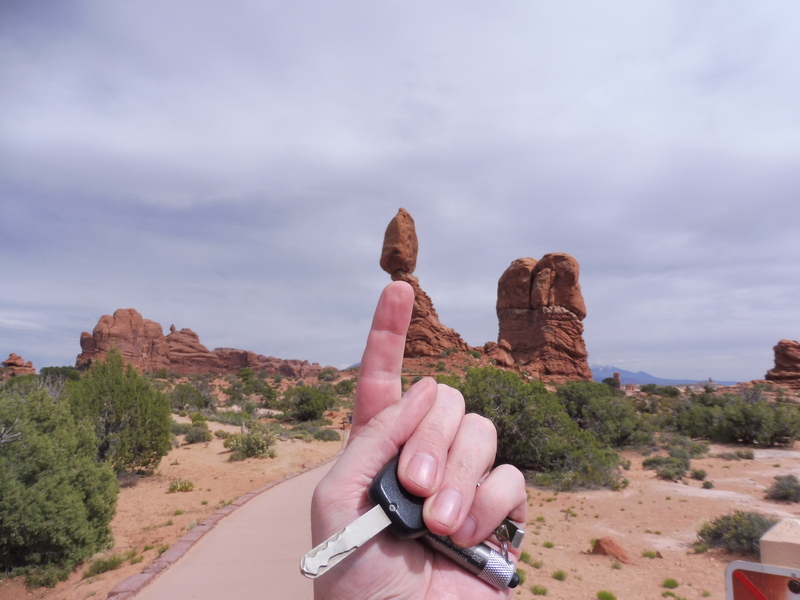 Day 5, May 8 Arches National Park -> Canyonlands/Needles area. Stayed at the Needles Outpost campground. Day 5, May 9 Canyonlands/Needles area -> Grand Canyon. Stayed at the Grand Canyon Mathers campground. Day 6, May 10 Grand Canyon. 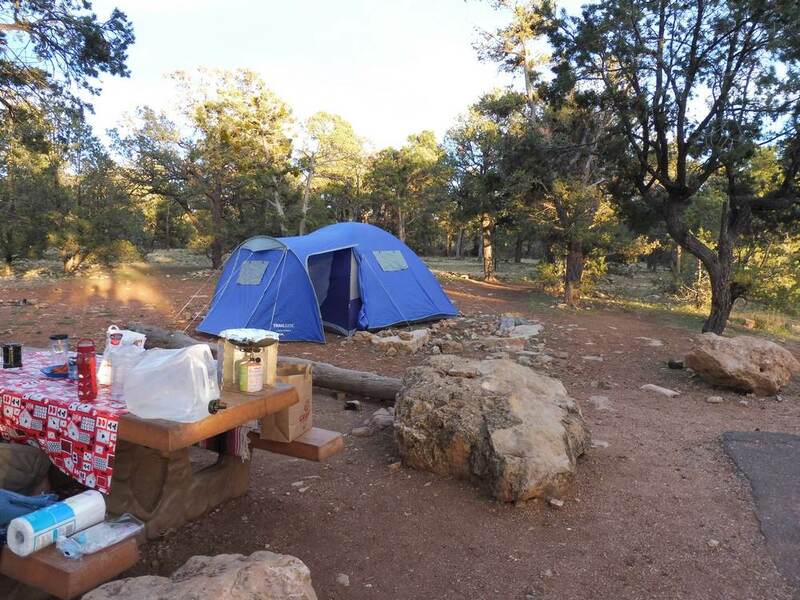 Stayed at the Grand Canyon Mathers campground. Day 7, May 11 Grand Canyon. Stayed at the Grand Canyon Mathers campground. Day 9, May 13 Palm Springs -> Temecula. 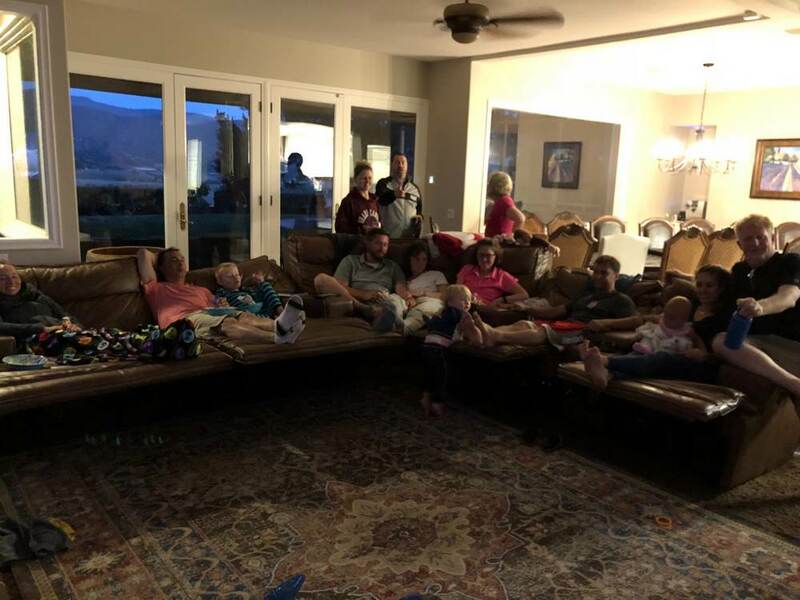 Stayed at the family reunion house (actually we tried to stay in our tent on the house property, but then the lawn sprinklers came on and put an end to that). Day 10, May 14 Temecula. Stayed at the family reunion house. Day 11, May 15 Temecula. Stayed at the family reunion house. Day 12, May 16 Temecula -> Reno. Stayed at the El Dorado hotel. 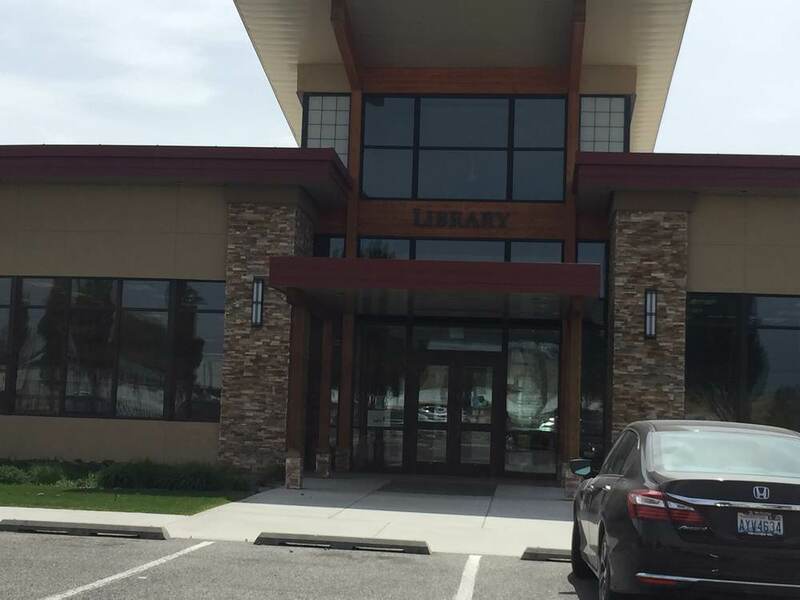 Day 13, May 17 Reno -> Klamath Falls. Stayed at the Shilo Inn. 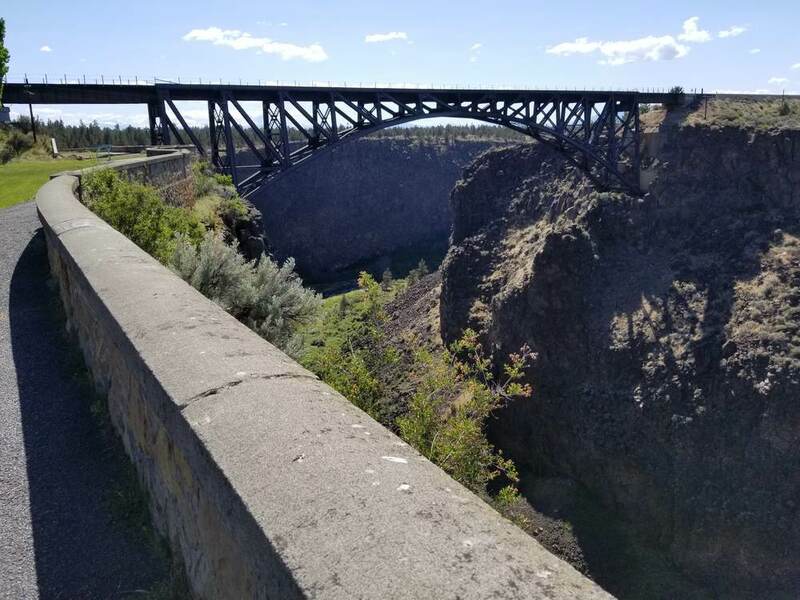 Day 14, May 18 Klamath Falls -> Madras. Stayed at the Econo Lodge. Day 15, May 19 Madras -> Tillimook. 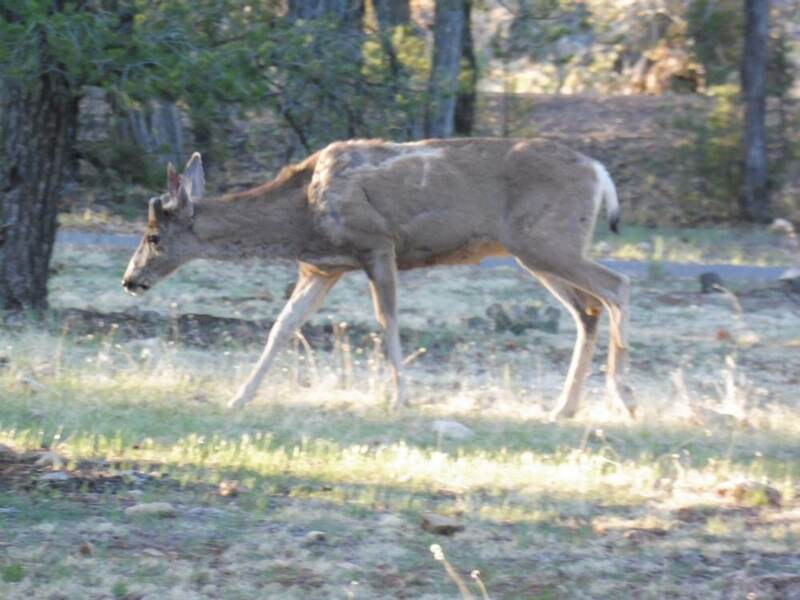 Stayed at the Tillimook State Park campground. Day 16, May 20 Tillimook -> Vancouver. Home! Summary: 6000km (3730 miles) over 9 states and 1 province. 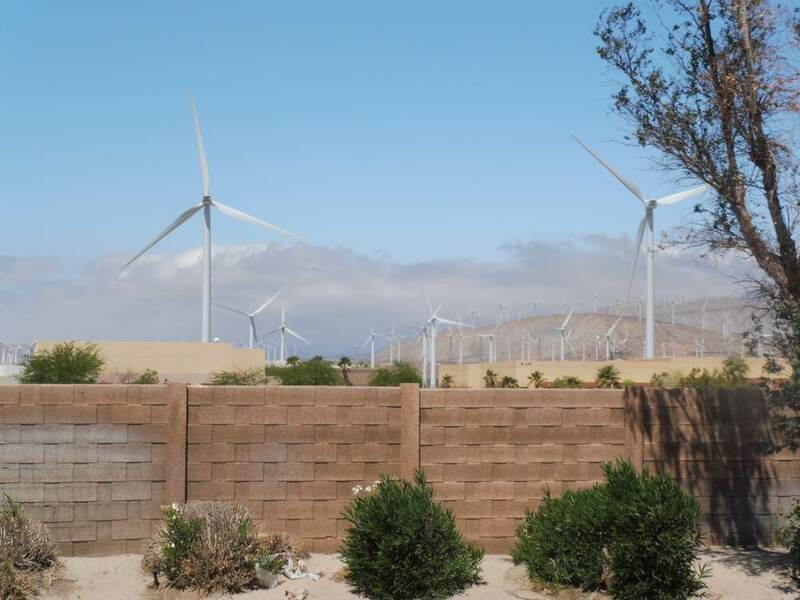 After a good night's sleep at the Motel 6 in Palm Springs (which was also across the street from a wind farm and the windiest hotel I've ever stayed at) we headed to Temecula for our family reunion. After leaving Temecula, Chris and I headed to Reno, Nevada. 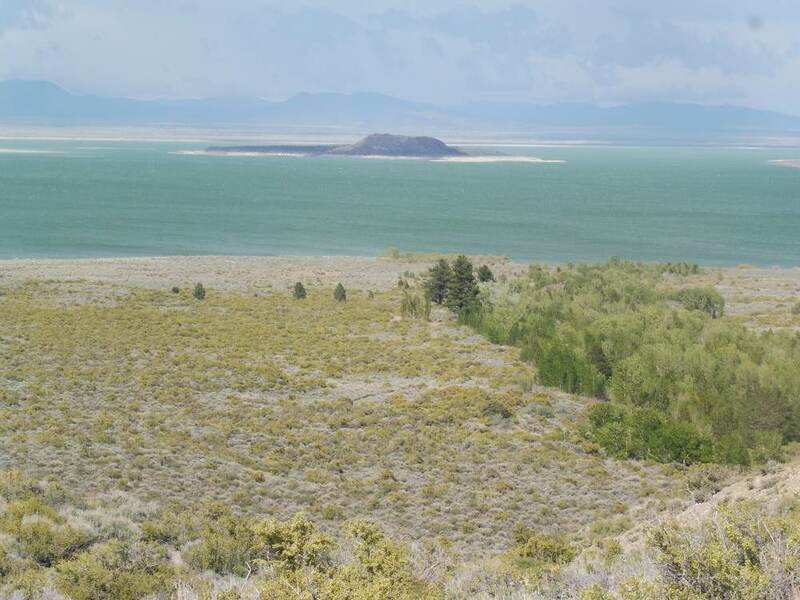 On our way there we saw a beautiful green lake called Mono Lake. We pulled over so we could enjoy the views for a few minutes. We were excited about getting to Reno, but in the end it just seemed a bit sad. Soon after we arrived we got into the elevator with a man in his 40s who looked at us in a depressed sort of way and said, "I think I lost too much money today", followed by, "I guess I'll win it back tomorrow. Gotta play until I make it pay." Though I love the energy and party atmosphere in Vegas, the excessive gambling side of it turns me off. Reno didn't seem to have a lot of energy, just a lot of over-eating and too much gambling. 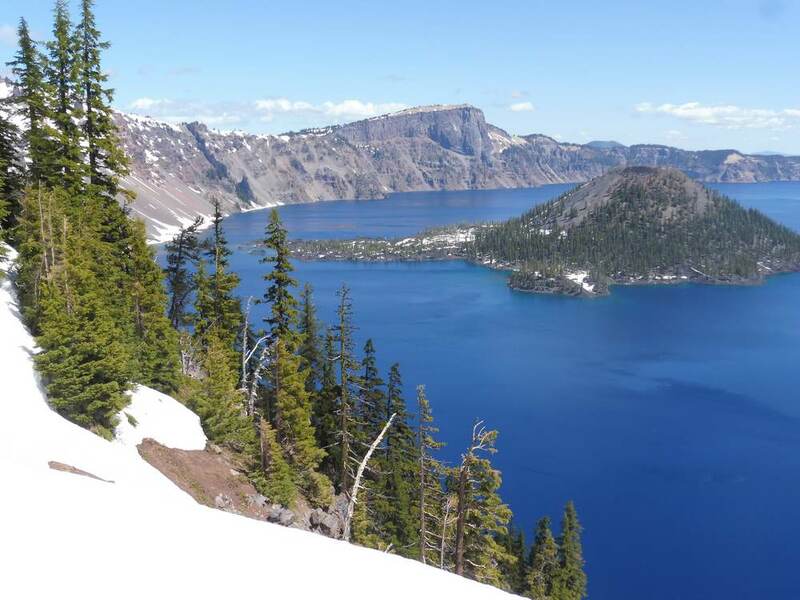 After Reno, we headed north towards Crater Lake in Oregon. We spent the night at a fun, small-town hotel with great service called the Shilo Inn in Kalmath Falls. The next morning, we headed to Crater Lake. 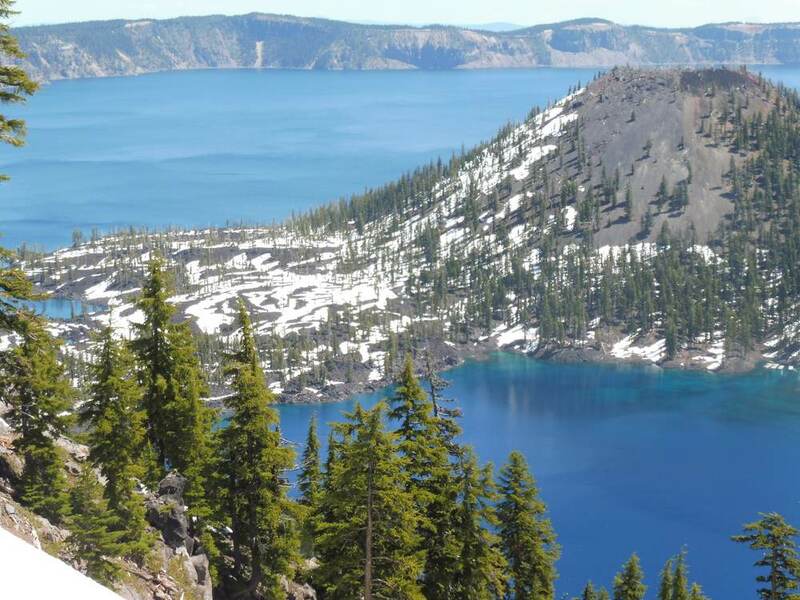 Crater Lake is the result of a volcano that collapsed on itself, leaving a massive hole in the ground that subsequently filled with rain and snow. The lake is crystal clear and beautiful. From the right angles, you can see the layers of lava under the water. Though much of the park was still closed due to snow (the park's elevation is around 6000ft), we did a short walk down rim road to check-out the lake from different angles. This afternoon, we were back in the car heading to Mt. Hood. Along the way we stopped off at a canyon viewpoint. The area was also covered with dozens of cute little prairie dogs! We stopped for the night at a motel in Madras about an hour from Mt. Hood, where I'm currently writing this post. Tomorrow, we'll drive to Mt. Hood where we'll take on the 12 mile (20km) Paradise Park hike, with a 3050ft (900m) elevation change - though how far we get will depend on the snow line. 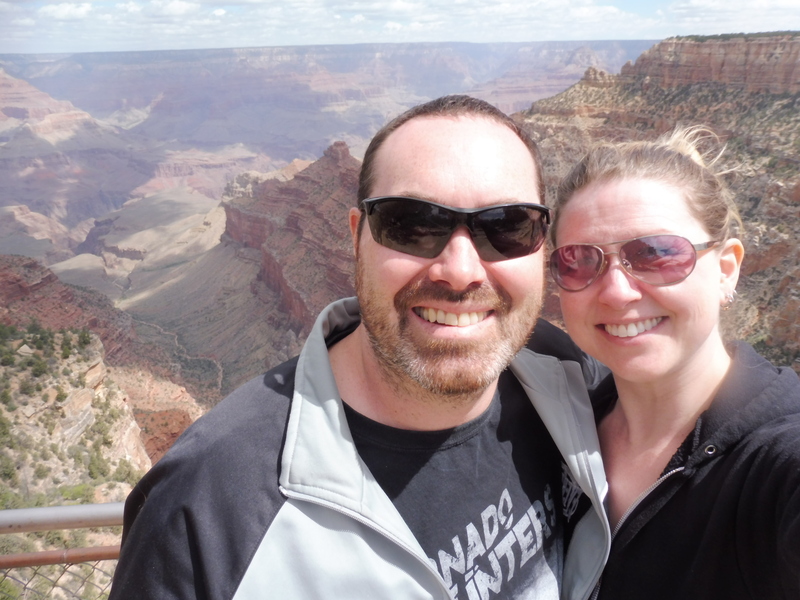 After spending an extra night in Utah's Canyonlands, we headed to the Grand Canyon's South Rim, via the 4 corners monument where 4 states, New Mexico, Arizona, Colorado, and Utah, meet. We arrived at the site and paid $5/each to get in. It was quite quiet and we were able to walk up to the monument right away and take pictures of ourselves in all 4 states at the same time. After the 4 corners, we headed to the Grand Canyon. Upon arrival at the park, we went straight to the first viewpoint and it did not disappoint. The canyon looked amazing! We stopped at several more viewpoints on the drive from the park entrance to our camp spot at the Mather campground. I had reserved 3 nights at the Mather campground at the rim of the south side of the canyon several months ago and felt lucky to have a spot there. 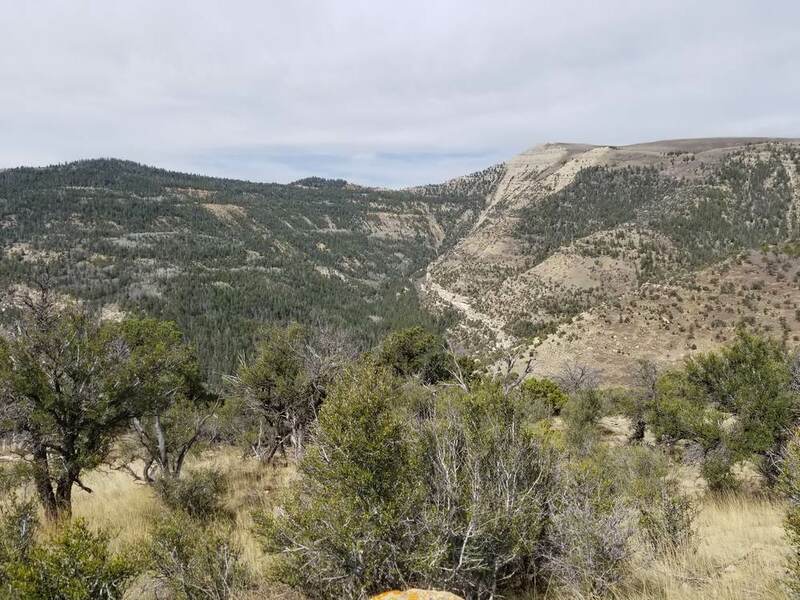 We were in the far-end of the campground in the Juniper loop and found the sites quite large and quiet - not what I had expected but exactly what I wanted! Most of the others near us seemed to be other couples, going to bed early so we could get up at ridiculously early hours to do some hiking before it got too hot out. My main goal for this part of the trip was the rim->river->rim hike down the South Kaibab trail and up the Bright Angel trail, for a total distance of 26 km, with a 1500m elevation change. The hike is not recommended by the National Park Service due to the long distance in extreme heat and high elevation, so I was a bit nervous about it. Chris had elected to do the shorter, but still strenuous hike down the Bright Angel trail to Indian Gardens and back up again, so I would also be doing it alone. The hike was amazing!! I'm so glad I did it and feel quite accomplished. If you want to read more about my preparation for the hike, and the details of the descent and ascent, I added them here. After our hikes, we celebrated with a hot shower followed by a delicious meal at the park's tavern. After a good night's sleep, we headed off towards Palm Springs to spend the night. Thanks to the 130km/hr speed limits in Idaho, reminiscent of our drive through Australia's Northern Territory, we made it from Boise to Salt Lake City quite quickly. 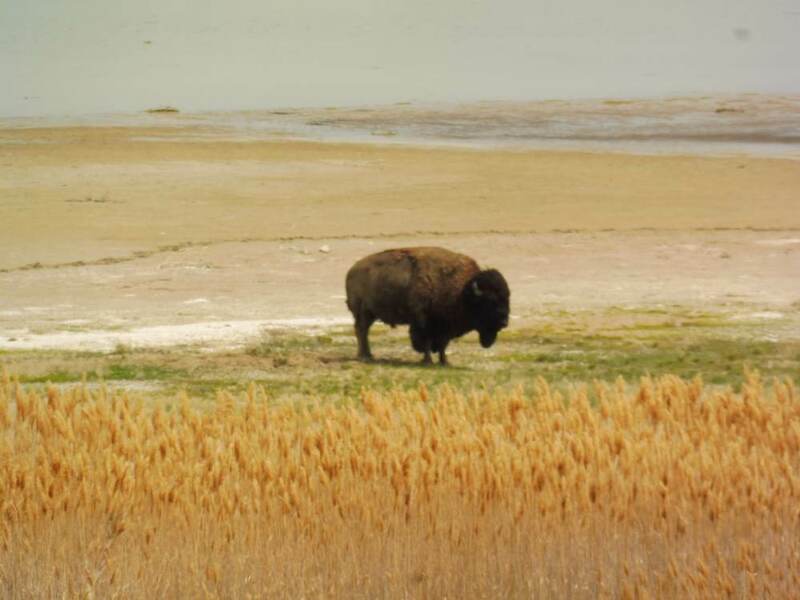 As we approached Salt Lake, we stopped at Antelope Island on the Great Salt Lake. I was looking forward to this visit, but ended up finding the area a little lacking. I was expecting a huge, welcoming lake but instead found a body of water that felt completely inhospitable. Despite these feelings, we did get to see some bison and what we think were antelope (based on the name of the island), but they could have been deer (note to self: lookup deer vs antelope). In Salt Lake City, we also stopped at an AT&T to deal with Chris' ongoing mobile phone coverage issues, which he'll post about later, then checked out the downtown area. Unlike in Vancouver, where I'm totally comfortable walking around downtown in cutoff shorts and a tank top, I felt extremely under-dressed among all the women wearing floral summer dresses. The downtown area was smaller than I expected, so after a quick rice bowl on a patio, we were back on the road. Chris was getting tired of driving, so I drove for the first time on the trip. And what a time to start! The population of Salt Lake is only about a million people, but you wouldn't know it from their busy 6 lane freeways where drivers go 140km/hr and change lanes often. I was regretting driving but pushed through the situation until we finally turned off onto a smaller 2-lane highway that was much more within my comfort zone. Down the highway and up a short mountain road, we found a quiet campsite with sweeping views of the valleys below. 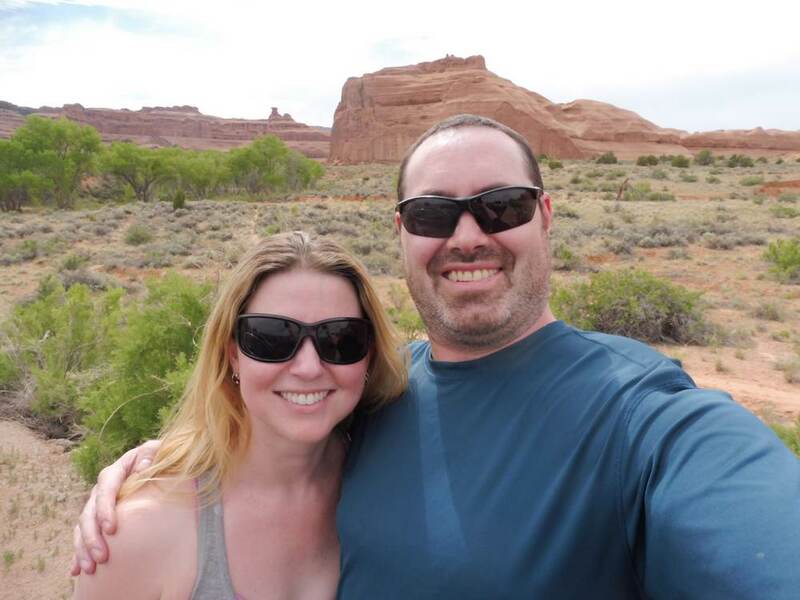 After a good night's sleep and a quick hike, we were on the road again towards Arches National Park. We hit Arches around 3pm on a Monday afternoon and waited about 10 minutes in line to get into the park (so many people!!). From the moment we arrived in the park, we were amazed. 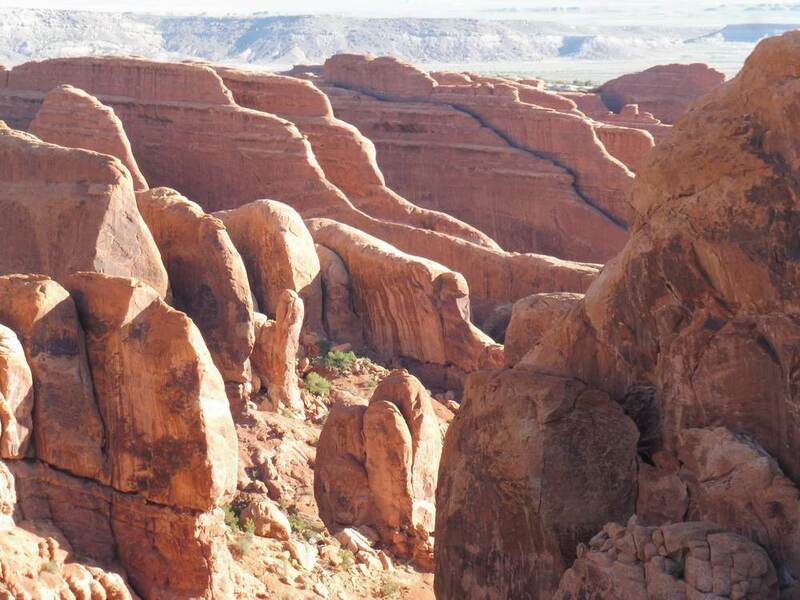 We've been looking at pictures of Arches online for years, but they don't prepare you for the vast, jaw-dropping rock formations and arches covering the entire park. 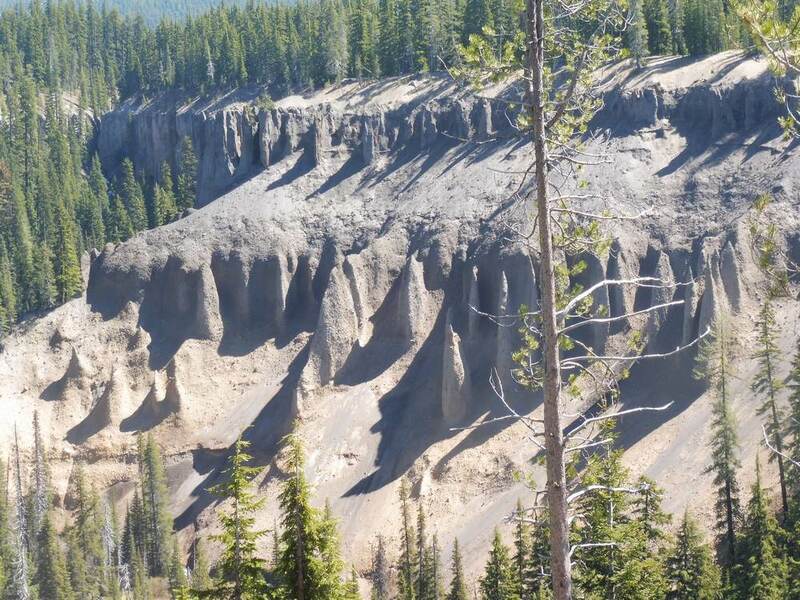 As we drove up the park's main road, our heads were on a swivel looking at all the formations around us. We kept pulling over to take pictures and just stand among the rocks. 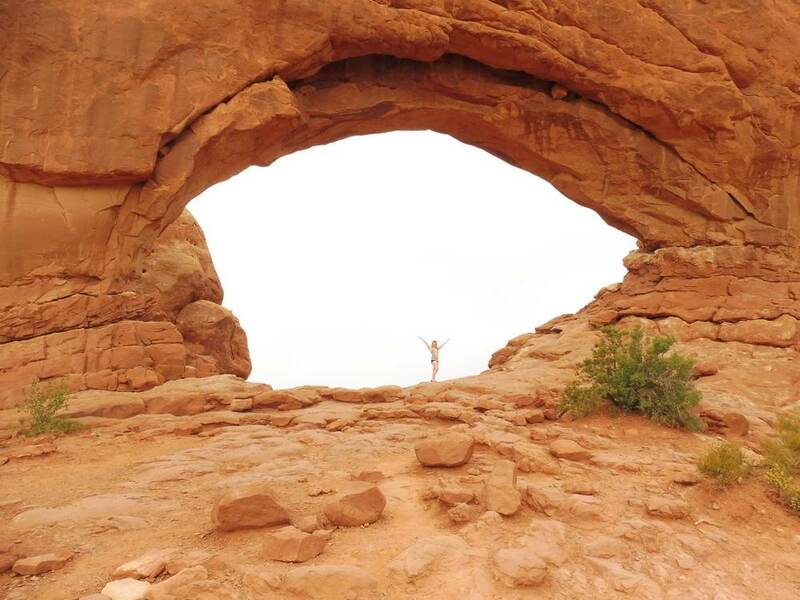 We stopped for a few small hikes to check out the more popular arches and even got lucky enough to be under an arch by ourselves for a few minutes. We wanted to spend more time in the park, but it was almost 7pm and we hadn't secured a place to stay that night. I'm glad we left when we did as it took us about 1.5 hours of driving around before we finally found a "campground". I put campground in quotes as it was just a big open field of dust, but it was really all we needed for the night. 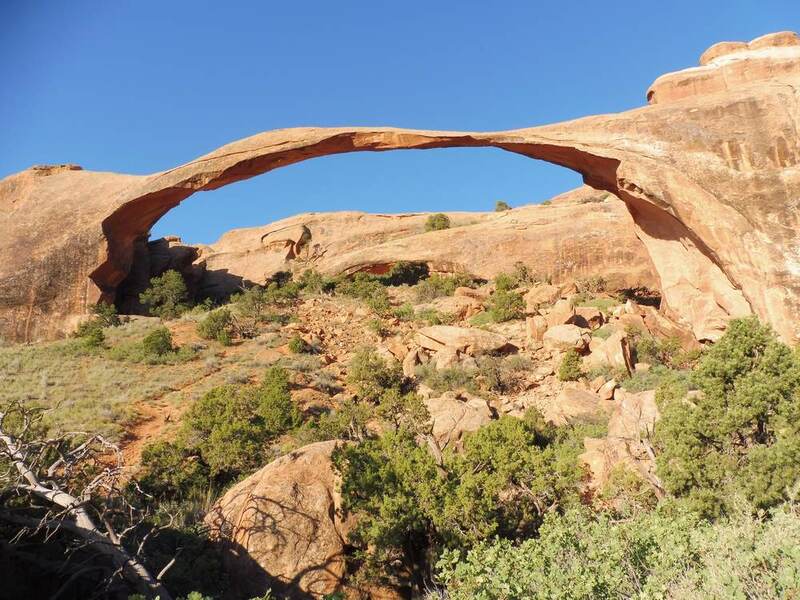 The next morning, we woke up at 5am to go back to the park for the famed 12km Devil's Garden hike, which takes you by 8 arches. We left our campsite by 5:30am and were at the trail head by 6:30am. We ended up fiddling around the car filling water bottles and preparing backpacks, and started the hike around 7am. The park had been packed the day before, but at this early hour there were only a few other cars in the parking lot, and we had the trail to ourselves. This hike was absolutely amazing. 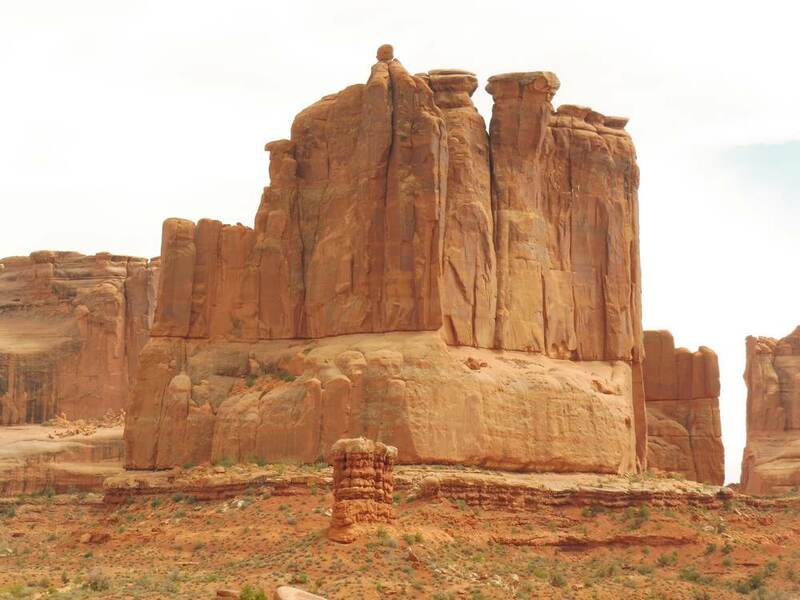 As I was walking, I could feel the raw energy and power coming from the rock formations. When we got under the first arch, I didn't want to leave. The second arch was even more stunning, with the blue sky and expansive views of the valley below. 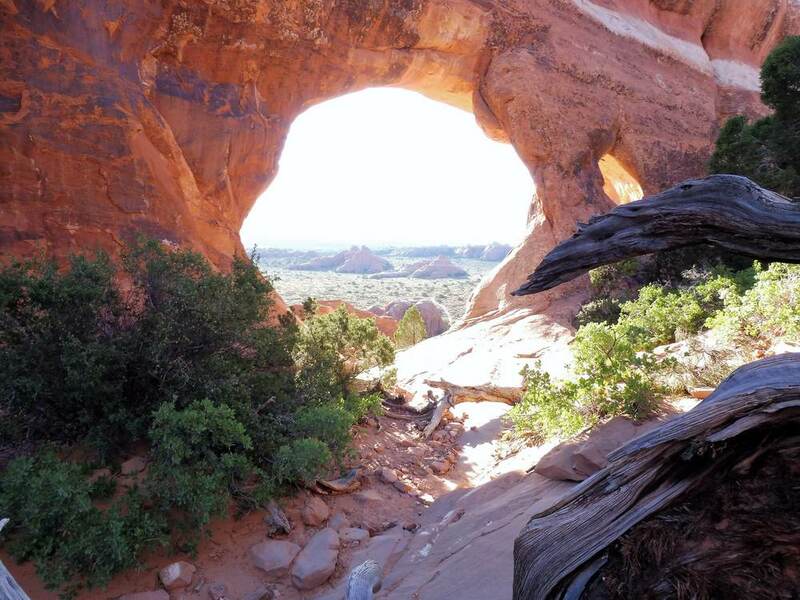 We just kept going from arch to arch, each one offering its own unique experience, from various rock striations to areas of solitude to picturesque landscapes. Just under 4 hours later, we were back at the trail head, which was now significantly busier, as many visitors only do the first portion of the trail. The busyness completely erased the earlier tranquility of the park and I was grateful for our early start. 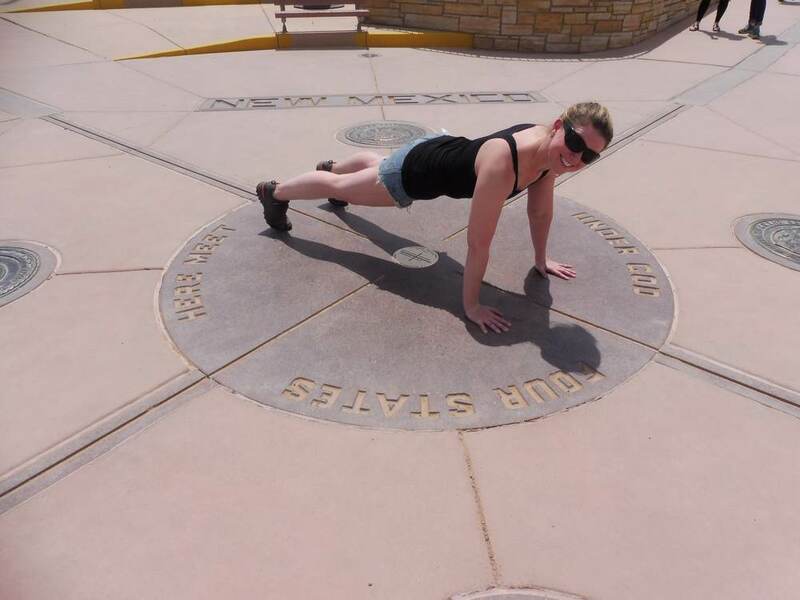 After we left the park, our plan was to go to the 4 corners monument. However, I'd read mediocre reviews and we weren't ready to say goodbye to Utah's Canyonlands yet. So based on a social media comment from a friend (thanks Rebekah! ), as we were driving down the highway we saw a sign for the Needles area and we made a last minute decision to head there. I'm so glad we did. 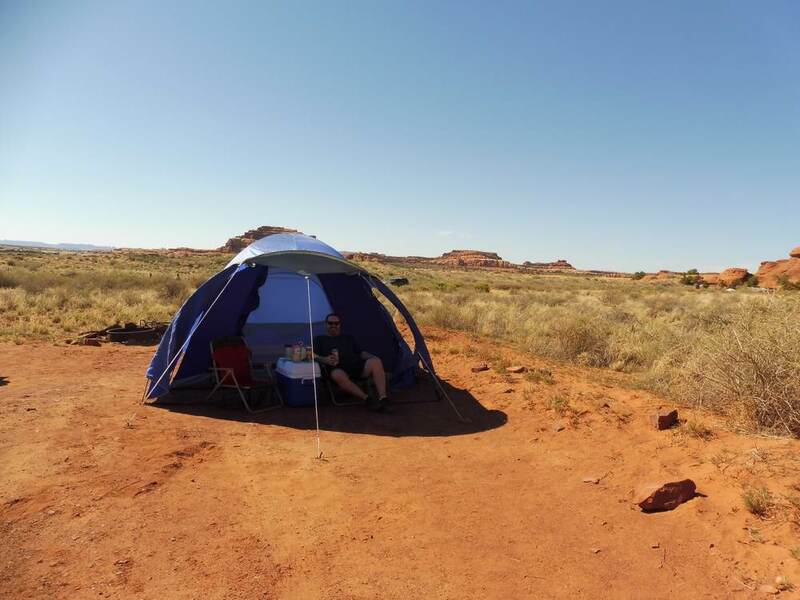 We found a great camp spot right by the rock formations and were able to relax and recover from the hike. I will end this post with a pic from our campsite that I've titled, "What Canadians do with their rain fly to stay cool in the desert". What a great start to our road trip to Temecula, California! Last night we drove from Vancouver to Seattle in time to have a (somewhat late) dinner with Ian (our friend of over 20 years!) and his lovely partner Jamie (who is an architect, a profession I strongly considered instead of computer science, so I always want to hear her stories). After dinner, Chris and I spent the night at the Motel 6 in Issaquah, just outside Seattle. 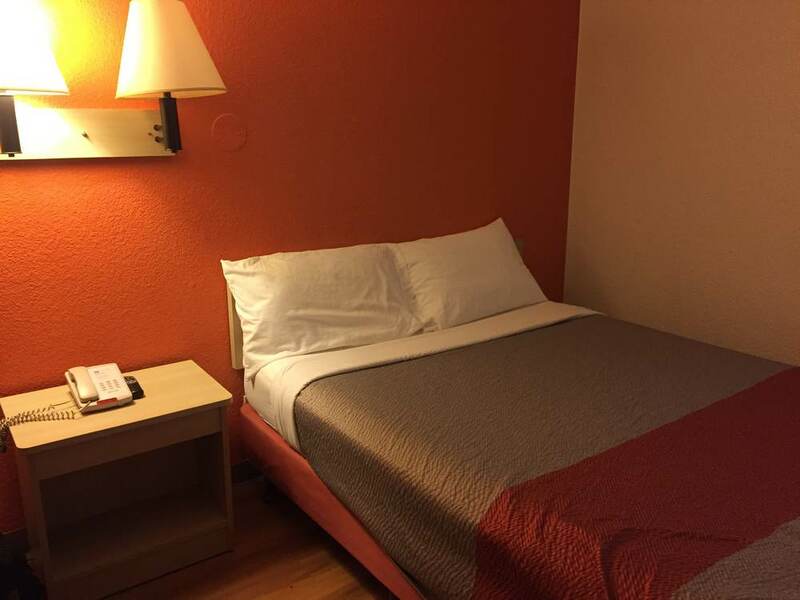 The room was inexpensive, newly reno'd, and perfect for a quick night sleep. Today, we drove 800km from Issaquah, Washington, all the way to Boise, Idaho. 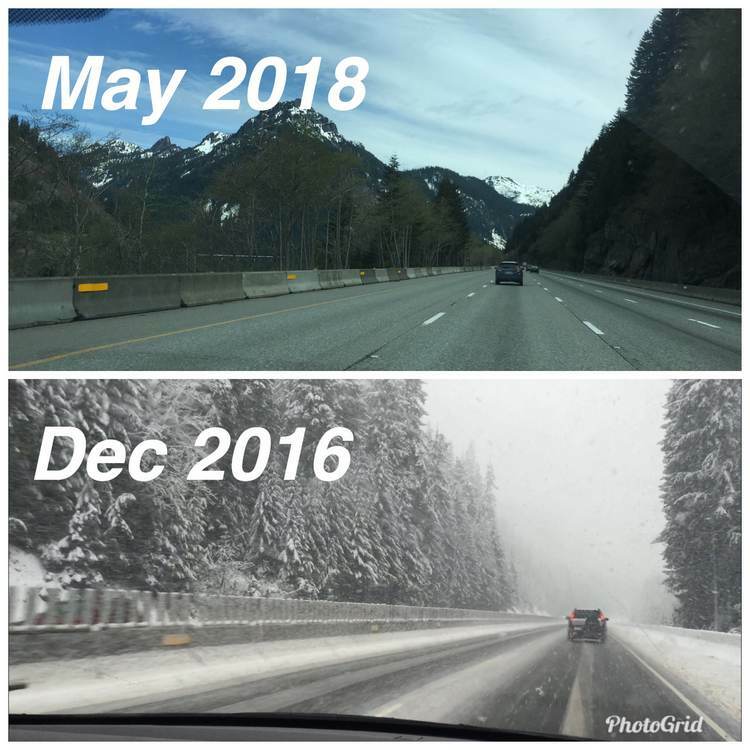 This included a drive through the Snoqualmie Pass - this was our second time driving the pass, but it was much easier this time as we had a lot less snow to contend with! As we neared the Oregon border we accidentally came across the cute town of Grandview. 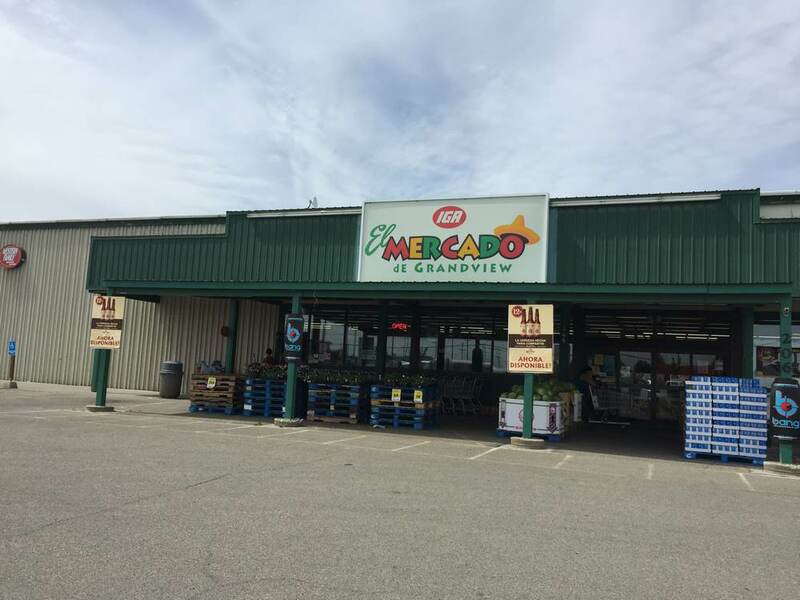 In the town, we found an IGA that focused on Mexican food - they had an entire aisle just for tortillas - Chris spent quite a bit of time poring over the selection before choosing a corn/flour tortilla blend. We had them for dinner later that day and I think he made the right tortilla decision. After another couple of hours on the road, we visited a Walmart. I don't go to Walmart very often, so I'm always surprised to see all the fun stuff you can buy there. Also, the parking spots were huge! We picked up some plastic camping bowls, sunglasses, and even a small rolling massage ball. The plan after that was to keep driving until we didn't want to drive anymore. We hit Boise and decided it was time to stop for the night. Otherwise, we risked driving another 2 hours before seeing any other camping or hotel options. So here I am typing up my blog at the Quality Inn, just outside of Boise. Happy Cinco de Mayo! I've been wanting to do a west coast road trip for so long, which is why I'm so excited about our upcoming trip. 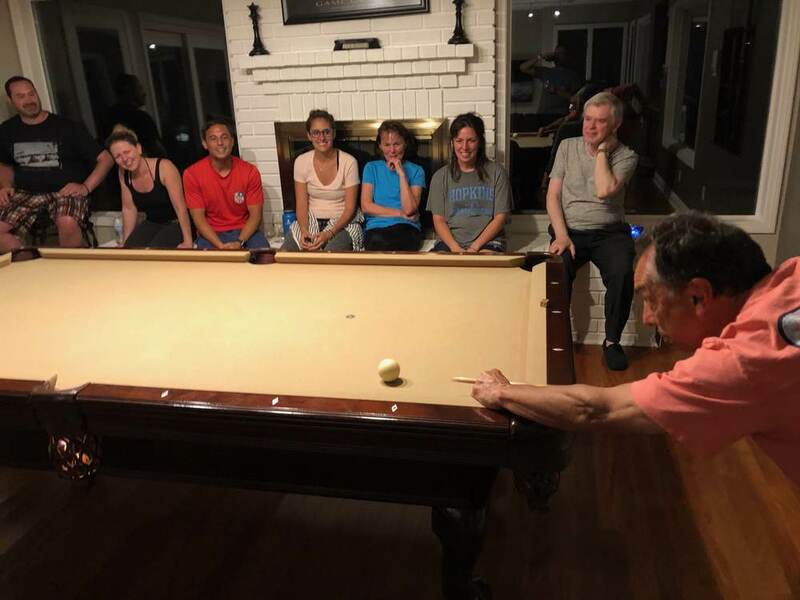 The main purpose of the trip is a family reunion that my cousin is hosting in Temecula, near Los Angeles. However, instead of flying down, Chris and I are going to drive from Vancouver to Temecula. On the way there, we're going to see some friends in Seattle, visit Arches National Park in Utah, hike into the Grand Canyon and back out again (22km in one day! ), visit the 4 corners, and maybe even go to Joshua Tree National Park, depending on timing. We'll spend a few days in Temecula visiting with our family, then head back along I-5 through California, Oregon, and Washington to get back home. 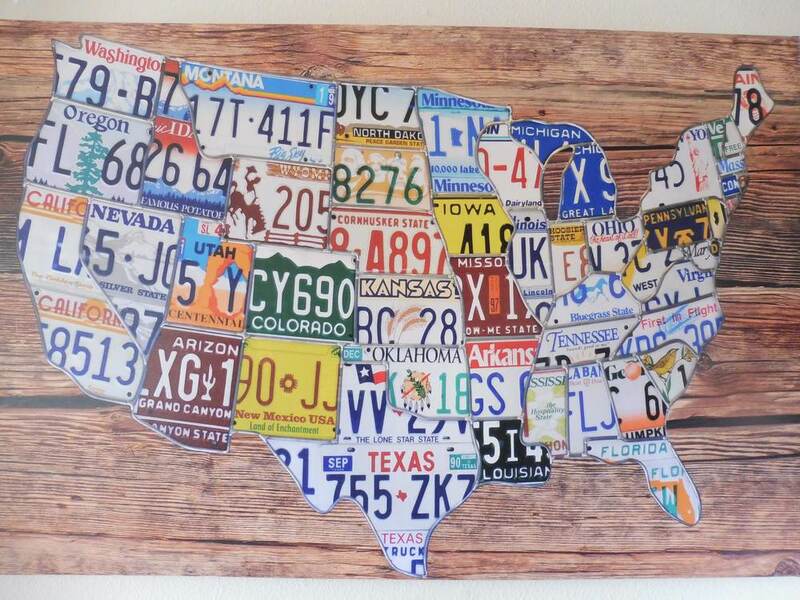 It will be over 5000km of driving over about 18 days, through 8 states. We're going to be doing quite a bit of hiking, especially in Arches and the Grand Canyon. I've been training 5-6 days a week to prepare for the hikes, including running and doing gym workouts focusing on leg strength and endurance. The hike I'm most looking forward to and most nervous about is the hike into the Grand Canyon. It's a 10km hike from the south rim of the canyon all the way down to the base of the canyon and Colorado River on the South Kaibab Trail. Once I've reached the bottom of the canyon, I'll ascend about 1400m over 12km on the Bright Angel Trail back to the top, making the total hiking distance 22km. Though the distance and elevation gain are similar to other hikes I've done, there will be significant temperatures differences between the top of the canyon (about 2 deg C.) and the bottom of the canyon (over 30 deg C.), plus I will be carrying quite a bit of water due to the hot and arid climate.